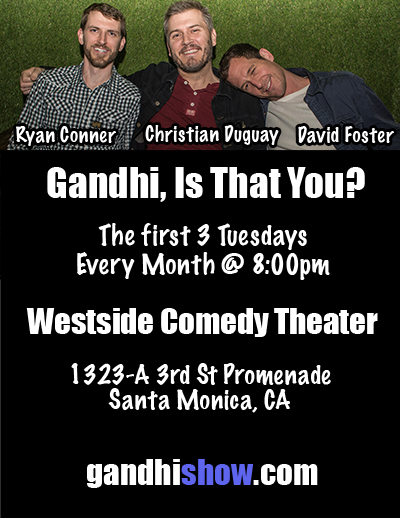 Gandhi Show: Los Angeles – GANDHI, IS THAT YOU? *The Gandhi Show Los Angeles is no longer active, but here you can read about it’s gloried past below! The first 3 Tuesdays of every month, Ryan Conner, Christian Duguay and David Foster welcome LA and NYC’s hottest comedians from VH1, MTV, Comedy Central, TBS’ “Conan” & more. The show features about 7 – 8 comedians all with national tv credits. The show (coming off the success of the popular NYC show running weekly for years) has become so popular that MTV and BRAVO have filmed at it. The Gandhi Show has headlined Carolines on Broadway and was also featured in the prestigious 2013 & 2015 New York Comedy Festival presented by Comedy Central (the show has also been featured in The Wall Street Journal, NY Daily News, NYTimes.com, Time Out New York’s “Critic’s Picks”, The Laughing Devil Comedy Festival, The Gundo Comedy Festival, headlined New York Comedy Club, etc. ), and famous comedians (i.e. 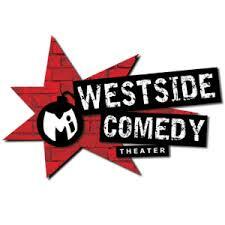 Louis CK, Jim Gaffigan, 30 Rock’s Judah Friedlander, SNL’s Jay Pharoah, “The Daily Show’s” Wyatt Cenac, Todd Barry) looking to try out new bits regularly drop by to perform. We just love putting on awesome shows and making people laugh. Period. Afterwards, many audience members stick around to hang and get to know each other. It’s a sweet after-party and a great place to meet new people! Everyone is welcome! Questions? – For questions or comments on the Gandhi LA Show, please send an email through the contact page. Louis CK, Jim Gaffigan, Judah Friedlander, Eric Andre, Todd Barry, Sasheer Zamata, Jay Pharoah, Michael Che, Ilana Glazer, Kurt Metzger, Joe Derosa, Christian Finnegan, Kevin McCaffrey, Luke Cunningham, Hannibal Buress, Paul Virzi, Dan Goodman, Nick Cobb, Kyle Fincham, David Cope, Helen Hong, Ryan Conner, Grant Gordon, Dan Hirshon, Dan Mahoney, Gary Vider, Ali Wong, Dave Lester, JL Cauvin, Ted Alexandro, Myq Kaplan, Sean Patton, Ryan Dalton, Carolyn Castiglia, Phil Murphy, Aaron Kominos-Smith, Mike Reardon, Andy Haynes, Matt Goldich, Dan Curry, Ruhbin Metha, Jeff Cerulli, Jay Nog, Kristeen von Hagen, Charlie Kasov, Mick Diflo, David Lee Nelson, David Angelo, Liz Miele, Josh Filipowski, Pat O’Shea, Nate Bargatze, Calvin Cato, Dan Enfield, Ben Kissel, Roger Hailes, Team Submarine, Joe Harrington, Jay Brown, Abbi Crutchfield, Pat Dixon, Sean Donnelly, Adrienna Lapulucci, Luke Thayer, Jason Saenz, Jesse Popp, Mark Normand, Guilia Rozzi, Rick Younger, Katina Corrao, Sagar Bhatt, Tom Shillue, Matt Pavich, and many more!